Ken Kerry isn’t your typical Hollywood director. The co-founder of infomercial maker Script to Screen LLC can direct a story as short as a few seconds or as long as 30 minutes. The company has made infomercials for 500 clients as diverse as singer Sheryl Crow, sprinter Usain Bolt and talk show host Montel Williams. It’s promoted the clubs of Adams Golf, the machines of SodaStream International Ltd. And the vacuum cleaners of SharkNinja Operating LLC. The books forward was written by David Oreck, founder of the famous Oreck vacuum cleaners company. Kerry, 56, grew up in Irvine, where he was inspired by a high school course to pursue a career in media. While at San Diego State University, he got a job as a production assistant at ABC Sports and spent a few years working on events such as Monday Night Football and the 1984 Olympics in Los Angeles. He interviewed celebrities, including football legend Joe Montana, and worked alongside famous announcers, including Al Michaels. Since opportunities to become a director at ABC Sports were limited, he moved to KDOC TV in Anaheim, where he could better hone his directing skills. He directed syndicated show “Golf Journal” there, meeting numerous pro golfers around the world. He also met a producer named Barbie. Who jokingly said she didn’t want to date him because she didn’t want to hear the wisecracks about their doll names. He eventually convinced her to marry him, and Barbie Kerry is now chief executive and chairwoman at Script to Screen; Ken serves as executive creative director. Infomercials started to appear in the 1980’s with the advent of cable TV channels and deregulation of television advertising. The couple received a $300,000 investment from a group of businessmen, including his future father-in-law, Bill Mitchell, who was a real estate developer for many years, including working in communications and marketing executive positions at eh Irvine Co.
A foray into selling self-help audio books made in-house didn’t turn out well. So they kept “grinding and testing” on infomercials for others, and eventually their work caught the attention of executives who wanted a new way to sell products. 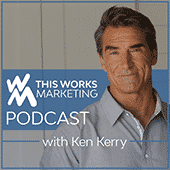 Kerry and his crew dive into marketing statistics and trends to find the best places to identify customers. “Convincing consumers that your product is better than the competitors is a science,” Kerry said. His firm employs a total of 15 and sometimes ramps up to 25 with contract help, working for five to seven clients at a time. Clients have annual sales of $10 million to $1 billion. Kerry said he sometimes takes a percentage if he believes in the product, such as Hooked on Phonics and Adams Golf. He wouldn’t disclose the agency’s own sales. Over the years, famous business owners have given Kerry strategic insights, including Oreck, who said a product should solve a consumer’s problem; Montel Williams, who urged empathy; and Jake Steinfeld, founder of Body by Jake, who advised him to never insult customers, such as calling diet product customers fat, and to always have a positive message. “There’s a specific methodology and strategic system of putting together the right message to sell a product,” Kerry said. “You have to take a potential customer, educate them with integrity and facts to turn them into a customer. There’s a specific psychological path to take them through. Ken Kerry said television won’t be going away because of social media platforms, such as Facebook and Twitter. He said that when companies build a business on the platforms, they find it difficult to scale, and thus turn to television, which can mean viewers ranging from the hundreds to the millions. An emerging phenomenon is connecting with consumers through voice technology, including Alexa and Google Home. For example, how can a milk manufacturer get Alexa, for instance, to order its brand of dairy products? Manufacturers’ boards of directors are discussing how to deal with retail and Amazon, both of which demand never ending price reductions, Kerry said. A possible alternative is selling directly to consumers, he said. A key is that the manufacturer keeps the consumer information, not Amazon or the retailer. He pointed to Unilever (NYSE: UL), which paid $1 billion in 2016 to acquire Dollar Shave Club of Santa Monica. While Shave Club was unprofitable, it had several million customers that Unilever can directly sell its other products to, Kerry said. “With the direct-response model, I’m going directly to the consumer, and they’re buying directly from me. Direct response is solving the problems of these businesses” being squeezed by Amazon or retail stores. His firm often dives into statistics. For example, his book cites a survey by Microsoft Corp. indicating “people generally lose attention after eight seconds,” and a Deloitte LLC survey that found 81% of Americans spend time looking at their phones while dining in restaurants. An advertiser on Facebook has “under three seconds” to get the attention of a consumer, he said. A TV ad can take up to 15 seconds to 60 seconds. “That process of getting somebody’s attention, recognizing the problem and introducing my customer’s product to solve the problem and why it’s better than the alternative, there’s a unique selling proposition. For example, Script to Screen’s website features many laudatory comments from customers.